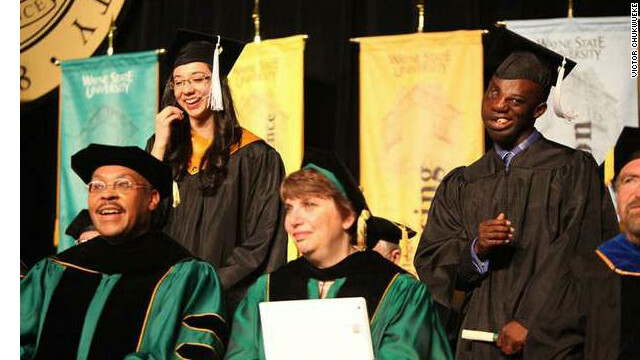 Victor Chukwueke spoke at his graduation from Wayne State University. He has been accepted to medical school. Lawmakers rally for Nigerian student living illegally in U.S.
(CNN) - His journey started in Nigeria, a taunted teenager with large tumors on his face, driven into deep despair. Eleven years later, Victor Chukwueke has undergone numerous surgeries and is a step closer to achieving his dream of becoming a doctor. In a rare act, the United States Congress passed a private bill last week granting Chukwueke permanent residency after years of his living in Michigan on an expired visa. The bill is awaiting President Barack Obama's signature. The bill would allow the Wayne State University graduate to attend medical school at the University of Toledo in Ohio, which requires him to have permanent residency. "The day Congress passed the bill was one of the happiest days of my life," said Chukwueke, who left Nigeria as a teen in 2001 to get treatment for the tumors. Private bills - which only apply to one person and mostly focus on immigration - seldom pass. His is the only private bill to pass in Congress in two years. "I was overwhelmed with joy; it was nothing less than a miracle," the 26-year-old said. "Only in this country can so many miraculous and wonderful things happen to someone like me." Before coming to the United States at age 15, Chukwueke lived in the southeastern Nigeria town of Ovim. He suffers from neurofibromatosis, a genetic disorder that causes massive life-threatening tumors on his face. Treated as an outcast because of his deformed face, he was depressed and humiliated, he said. His family abandoned him at an orphanage. Nuns from the Daughters of Mary Mother of Mercy rescued him from the orphanage more than a decade ago and arranged for a Michigan doctor to perform surgery on him. He says he considers himself lucky to have developed the tumors. "Without them, I would not have met the nun, left Nigeria, arrived in the U.S. and had the miracle to attend medical school," he says.